It’s not always convenient to go to the toilet when you feel the urge. We’re all guilty of putting off going to the toilet when we’re busy. If you have a busy job it’s tricky to fit a toilet break it, particularly if there isn’t a nearby bathroom. However, if you hold your wee in until you’re absolutely desperate most of the time then you will be straining your bladder. Not urinating frequently enough leads to an atonic bladder; meaning a bladder that is not strong enough to hold urine in properly. 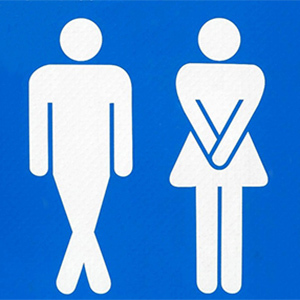 A weak bladder will have a knock-on effect on your pelvic floor muscles. Try to give yourself a toilet break every two to four hours; if you need to go, go. It’s only a few minutes out of your day that can save you a lifetime of pelvic floor problems! This is mainly a female thing; fears about germs lead some women to hover over the seat while they are peeing to avoid touching it. When you squat, the muscles in your pelvis are all activated and engaged. This includes your pelvic floor muscles, which prevents your bladder and bowels from fully emptying. Squatting to pee can cause a weak pelvic floor in the long term as well as urinary tract infections. If it’s germs you are concerned about, don’t worry – the seats of public toilets are not actually that dirty! Studies have found that the average kitchen counter has far more bacteria on it than a toilet seat; around 200 times more! Toilet seats were found to be one of the least contaminated areas. So, next time you go, give yourself and your pelvic floor a nice little rest by sitting down. Do you often find yourself rushing to finish in the bathroom? Bearing down when you wee or poo puts a lot of strain on your pelvic floor. When you do this your muscles become overstretched and weakened. If you’re constipated then it’s hard to avoid straining, but ironically this type of strain can lead to the opposite of constipation – faecal and urinary incontinence! If you have difficulty urinating or defecating a lot of the time, then you may need to make adjustments to your diet by drinking more and eating more fibre. It can also help to use a toilet stool such as the Go Better stool. The Go Better stool helps to put you at a much better angle for going to the toilet, so you can poo easily and quickly. Did your mum make you go to the toilet before you left the house when you were little? For many of us, this habit continues into adulthood. You may think that you are doing yourself a favour by going to the toilet before a long journey. But what you are actually doing is training your bladder to only hold a small amount of wee at once. This causes you to feel the urge to go when you don’t actually have a full bladder – when this gets bad it’s known as urge incontinence. Pelvic floor exercises can help to retrain your bladder to work properly again. Kegels strengthen the muscles that control urination. The Kegel8 Ultra 20 Pelvic Toner and Kegel8 Tight & Tone both include programmes specifically for bladder weakness. They will help you learn how to do kegels for a stronger pelvic floor that will help you cure and prevent incontinence.